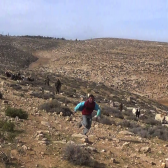 At Tuwani – Between 18-20 January, four Palestinians and two Operation Dove (OD) volunteers were arrested by the Israeli police and army while Palestinian shepherds were grazing their flocks. 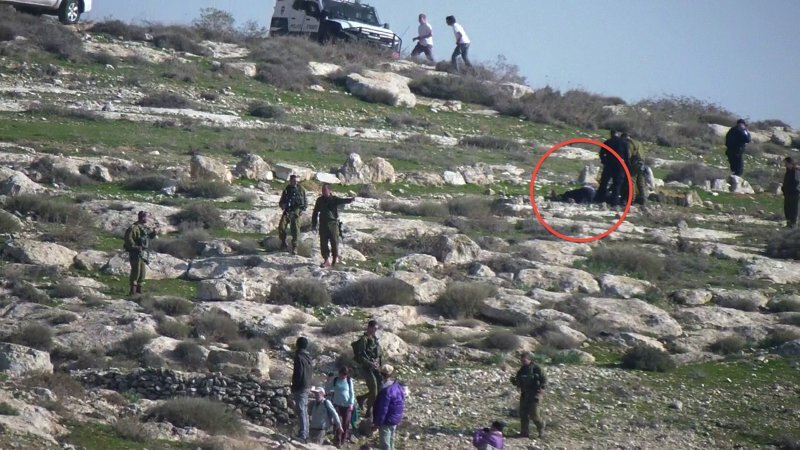 On 18 January at 1:04 p.m., seven settlers came out from the illegal outpost of Havat Ma’on (Hill 833), and entered the Humra valley while two of them crossed the Palestinian-owned fields, trespassing in an area for which entry is prohibited for Israeli citizens. Meanwhile, two Palestinian shepherds, accompanied by three OD volunteers, were grazing their sheep in this area. At 1:14 p.m., the shepherds left for their homes and encountered another group of five settlers. After one minute, Israeli soldiers arrived, telling the settlers to move away and declaring the area a closed military zone. Subsequently an additional nine settlers arrived to the area, along with several Palestinians and Israeli activists, the Israeli police, Border Police and officials from the District Coordination Office (DCO). Once the Israeli forces start to push the people away from the area the shepherd, Mfaddi Ahmed Rabai, refused to leave the area, claiming his right to remain on his own land. While a policeman and a group of soldiers tried to arrest him, he collapsed on the ground. Circle denotes place where Rabai is lying on ground. At 13:43, the Israeli army forced everyone to leave the area. Palestinians, Israeli activists and OD volunteers slowly came back to At Tuwani. The Israeli police arrested Mfaddi Ahmed Rabai and brought him to the Kiryat Arba police station before the ambulance arrived to check his health. Rabai was released after some five hours of detention. On 19 January, five Palestinian shepherds from Umm Al Kheir and Tuba villages were grazing were grazing their flocks in the Umm Zeitouna valley, accompanied by two OD volunteers. At 10:58 a.m., an army jeep arrived and three soldiers chased the shepherds along the valley. After several minutes, the soldiers were situated very close to a Palestinian child, so an OD volunteer placed himself between them. The soldier then forcibly took the passport of the OD volunteer. Afterwards the same soldier caught a Palestinian man and asked the other OD volunteers to give him their passports, but they refused. The soldier threatened the OD volunteers with arrest and ordered the other soldiers to bring them to the jeep. The soldiers, the OD volunteers and the Palestinian walked toward a gravel road inside Ma’on. Once there they encountered three settlers, including the settlement’s security chief, and two policemen. The police officers collected every detail about what happened and declared that the OD volunteers and the Palestinian were under military arrest. At 12:40 p.m., the army brought them to the Kiryat Arba police station by jeep. Those arrested waited several hours inside the police station without knowing the charges against them. At around 5:45 pm the Palestinian shepherd was released after the policeman took his fingerprints. The OD volunteers were released at around 8 p.m. after been interrogated for forty-five minutes total. On 20 January at around 8:20 a.m., two Palestinian children from Umm Al Kheir were chased by Israeli soldiers while leading their flocks to the grazing areas in the nearby valleys. Meanwhile another Palestinian went up the hill facing the village to videotape this chase. Two settlers, three soldiers, seven women from the Palestinian village came to that hill and at 8:44 a.m., the Israeli police arrived. The security chief of Karmel settlement told the police that two women on the hill tried to stone him. After half an hour, the police arrested the Palestinian women and brought them to the Kiryat Arba police station. They were released at 3:35 pm without any charge. The villages of At Tuwani and Umm Al Kheir are situated in the South Hebron Hills, defined as Area C. According to the Oslo accords, Area C is part of the West Bank under full Israeli civil and security control. Like many of the Palestinian villages located in area C, At Tuwani and Umm Al Kheir suffer from settler and military intimidation and violence. As a result, the Palestinian residents encounter great difficulties in accessing their own lands for their everyday farming activities. This entry was posted in Settler violence, South Hebron Hills and tagged At-Tuwani, Havat Ma'on, Karmel, Operation Dove, Settlements, Um Al-Kheir. Bookmark the permalink.